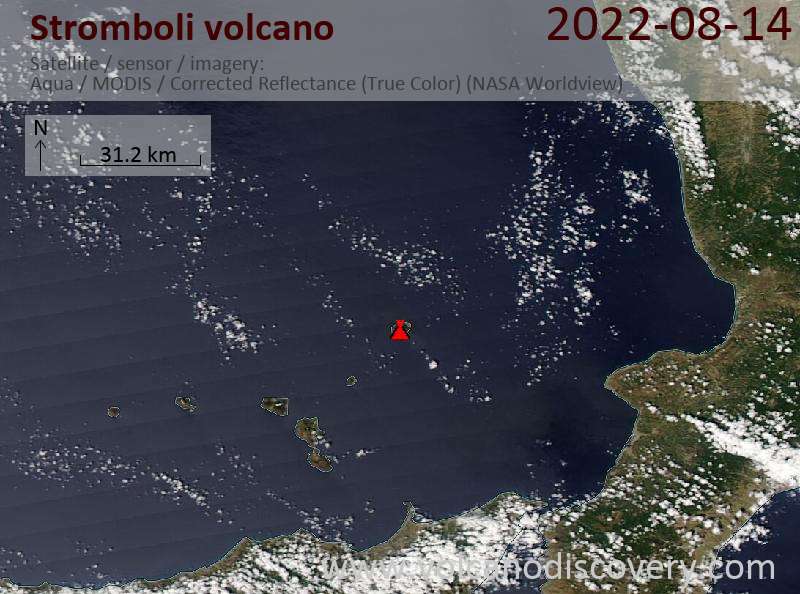 Stromboli, a small island north of Sicily, is one of the most active volcanoes in the world and famous for its normally small, but regular explosions throwing out glowing lava from several vents inside its summit crater. This activity has been going on for at least 2000 years, as long as there is written memory of the activity, which Stromboli lended its name to, the so-called strombolian activity. Persistant (near-constant) activity since at least 2-3000 years. Most recent effusive (lava flow) eruptions from Dec. 2002-July 2003, March 2007, Aug-Oct 2014. Small explosive (strombolian) eruptions, typically every 20-30 mins. Intermittently, ca. every 2-20 years, minor effusive eruptions (lava flows); on average 2-5 times per year larger explosions. The most significant of these lava flows was in the evening of 17 July. Being issued more towards the east from the vent itself, it took a through a gap between the N1 and N2 vents and traveled on the upper Sciara a bit more to the north compared to the previous lava flows. By the afternoon, it had already more or less stopped. Many rockfalls have been occurring on the Sciara during the whole day. Since 11 July, the volcano has been calmer compared to the previous weeks. No new lava overflows on the Sciara del Fuoco have occurred since 10 July, but who knows if a next surge of magma is already underway soon? It almost appears that these peaks of activity are following each other at intervals of 2-3 days. Similar as during the last times, activity is fluctuating. After a few hours of increased lava effusions, it dropped and the new lava overflow creased again yesterday evening. Tremor is elevated as well. Activity decreased again last night, and the latest lava flow (almost) stopped. Very weak lava effusion continues from the NE hornito vent ("N2" in INGV Catania's nomenclature) at the time of this update. The first flow from earlier today, that had started at around 04:50 local time, had in the meanwhile decreased and eventually stopped in the hours after 12:00. Tremor has risen again as well, and a smaller lava overflow from the NE hornito is visible inside the crater terrace. Strombolian explosions continue to be intense and frequent at the summit vents. At the moment, the flow is still active and has a length of approx 2-300 m on the upper Sciara beneath the NE crater. The crater terrace of Stromboli this morning (Pizzo webcam, INGV Catania). Tremor has returned to normal levels. A relatively large rockfall occurred at the Sciara del Fuoco yesterday morning at 09:23 local time. Following intense phases of continuous spattering (or small lava fountaining) from the central and other vents, accompanied by increasing tremor, a first intra-crater lava flow started around 08:30 local time from the NE hornito (S2). Shortly after, starting from 11:18 an effusive vent starts to open up on the outer northwestern slope of the crater terrace, some ten meters beneath the NW vent complex (vent S3), and issue a lava flow directly onto the Sciara. The first 3 lava flows yesterday: the first (below) as intracrater lava flow from S2 (northeast hornito) vent, the second flow as short-lived flow from a new vent on the outer NW slope beneath the crater rim (top r), and the third flow, again an intracrater flow from S2 in the evening. Frequent rockfalls are occurring on the Sciara del Fuoco, but (so far at least) no new lava overflows. 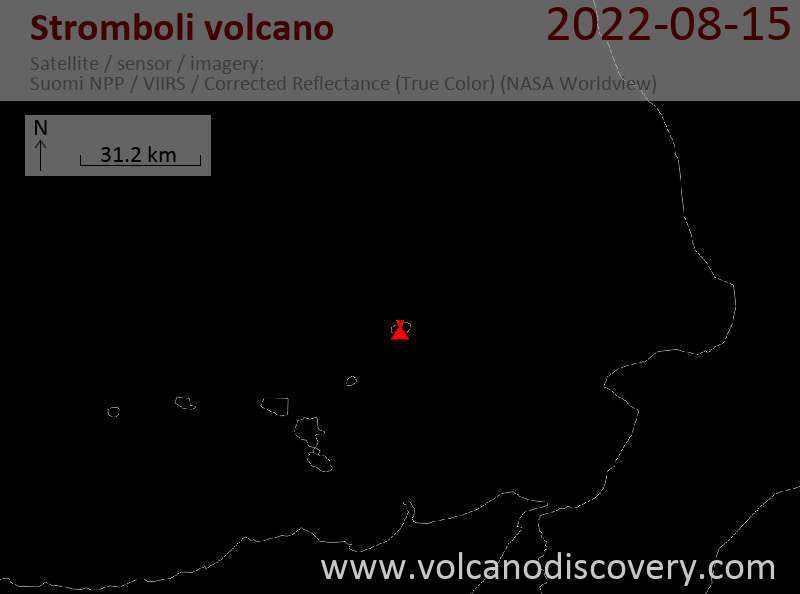 Towards the end of May 2014, activity at Stromboli volcano strongly increased as the magma level inside the conduit rose considerable. We present a selection of images from 9 and 10 June. Activity at the volcano remains elevated. A small lava overflow from the NE crater occurred today and an increase in tremor was reported. About half of them were showing constant or, some, intermittent weak to strong spattering: in particular, the twin vents of the central crater, two vents in the western crater, the NW hornito, as well as, intermittently, the hornito at the northwestern rim of the NE crater. Recently discovered dinosaur footprints in volcanic ash layers on a remote island volcano challenge the widely accepted theory that dinosaurs got extinct 65 million years ago. Some of them might have survived for much longer.